There are already major threads for harnesses, shields, ebay finds, etc., so I thought it was time to expand a bit into the area of firearms since they too are part of "myArmoury." My idea with this thread is to provide a place we can share pictures and comments for our firearms collections from the beginning of black powder to the introduction of cartridge weapons. I think anything past 1865 may get a bit too problematic...but that's just my prediliction. So I'm floating the balloon to see if there is enough interest out there to give it a go. If you guys think it's a worth while effort, I'll start by posting some pictures of my recent Scottish steel pistols from Carriage House and the Pitcairn retroduction. while i would love to do this, I'm not so keen on the at large public seeing what guns I do have in case of people casing people for robberies etc. I like the idea so here is my 17th c. Scottish rifle with converted snaphaunce lock. The barrel is rifled in .50 caliber. The stock is shaped in the "Scottish National Style" with the appropriate flutes. 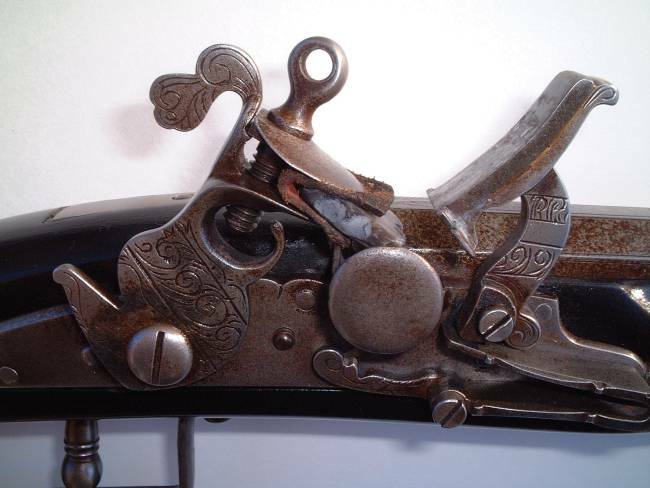 The trigger guard is similar to the one found on the "Breadalbane Gun" which is the oldest known Scottish long gun. The gun was built by Steve Krolick of Wisconsin. I have one other Krolick piece, which I will post later. Hell Yes! Beautiful piece, Lin. I've always wanted a true Scottish style long gun, but have had to settle for English style smoothbores up to date. I understand Chuck's concern, but I'll admit to having access to a number of match, flint, percussion, BP paper and metalic firearms, both custom and production. A few pics might show up later this weekend. Me neither Chuck but I will roll the dice on this one. Everything is very secure. ya i guess you guys are right. i mean its not like we're sharing serial numbers etc. I've got several firearms I could post but the only one that has any historical value or is special to me is my 1943 Springfield Armory M1 Garand rifle. This rifle was made in November of 1943, went to Europe sometime after that, was given or loaned to Denmark after WWII and was then given back to the U.S. government in the 1990's. It made it's way to the Civilian Marksmanship Program where it was sold to the private citizen I purchased it from. What makes the rifle special for me is that it still has the original November 1943 barrel, which is relatively rare, and I purchased it to commemorate an important event. Some day I will ship it to a professional restorer for new wood, re-parkerizing and complete tune-up on the internals. It will look like a brand new rifle. that's a beauty! I've got a 41 Winchester. 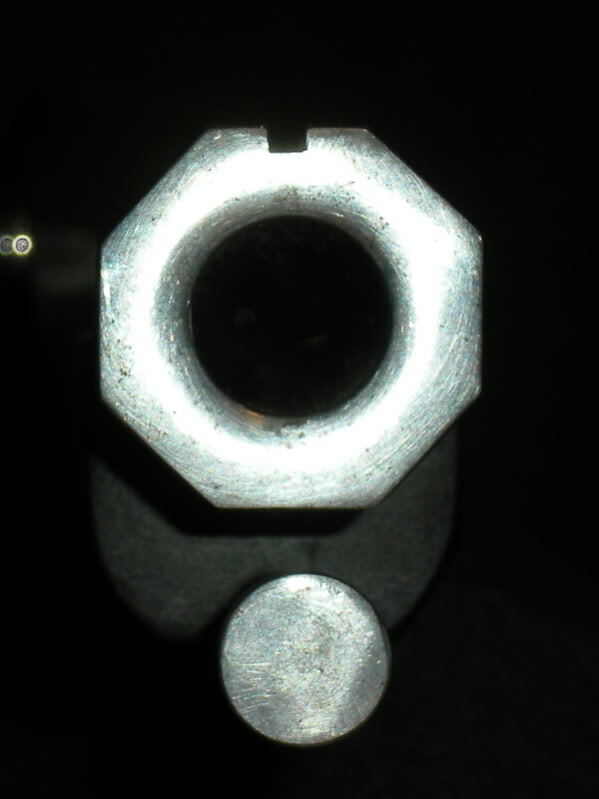 but alas the stock, barrel and trigger group are not matching. That's a really nice fusil, Phil. Who made it and was it patterned after an original? Also, for you Chuck...I'd sure hate to meet that kid in a dark alley...oh, wait a minute, you probably mean that stovepipe standing next to him, don't you?? That's pretty common for these surplus Garands. The only two parts on mine that I'm confident are original are the receiver and the barrel. There are several other parts that could, based on numbers, be original to the rifle but the odds are against it. I felt lucky just to get the WWII barrel and extremely lucky that it still shoots very well. Almost all surplus Garands, and M1 carbines as well, are arsenal rebuilds. Rifles with all matching serial numbers can be found but they are very expensive and most are in the realm of collectibles, meaning they should not be fired, which would lessen their value. After WWII, when many of these rifles were put into storage, they were first overhauled at the arsenal and replacement parts were pulled from whatever bin was handy, which accounts for all the mis-matches. These guns were used and abused by GIs all over the world and to be safe for use in future conflicts they had to be rebuilt. They were also fired with corrosive-primed ammo, which ate up the barrel throats unless cleaned thoroughly. Some of the nicer rifles available in recent times were brought back from Korea in the early 90s. I was fortunate enough to get one and it is like a new rifle, except for the mis-matched numbers and the stock, which has a large replacement piece in the toe. They are great shooters. Just to keep things moving, here is a photo of the lock area of my other Scottish rifle. Like the first one I posted, this rifle has a modified snaphaunce lock, retaining the original battery with a pan cover welded on. The pan cover has been removed and all holes filled. 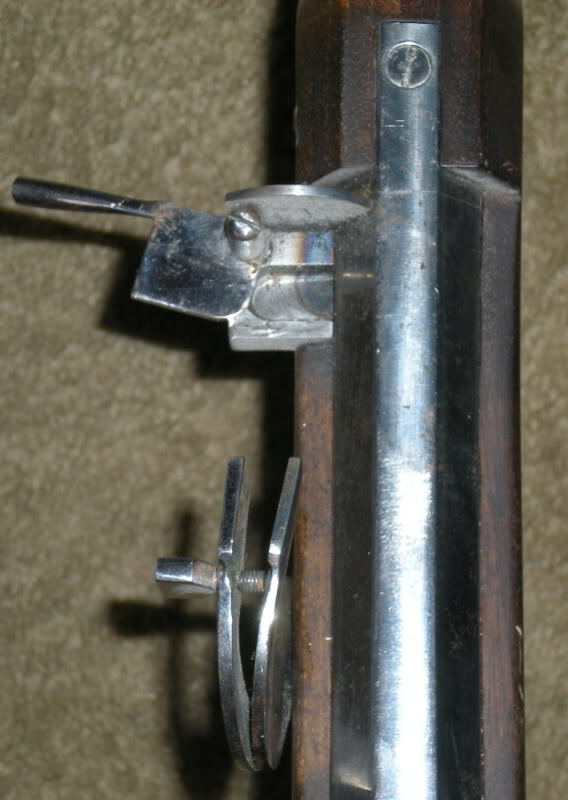 The gun maker produced the lock plate, hammer, battery and fence. The internal workings all came from a Siler lock, meaning that replacement parts are easily found. This rifle was also made by Steve Krolick and represents a Scottish long gun from about 1650 which was later restocked by someone familiar with the French/Dutch school of stock making. I do not have good photos of the complete gun but will post some when I can. 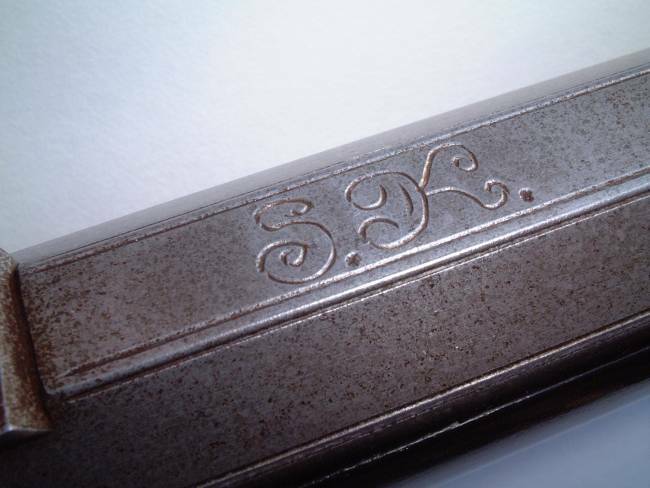 Here also is the top of the barrel where the maker put his initials. The decorative line runs the complete length of the barrel and is perfectly straight, which gives you an idea of the quality of this piece. It is also .50 caliber and rifled. I recently had this made. It uses several different elements of period 17th Century guns. It is roughly a 1660 era gun, that was used to replace the match locks by the french and french allies(natives) in new France. Postage stamp size photos are a cruel joke... we want to SEE your new smoothbore. But here is just a couple of my firearms... I do live fire with everything I own. i.e powder and projectile. 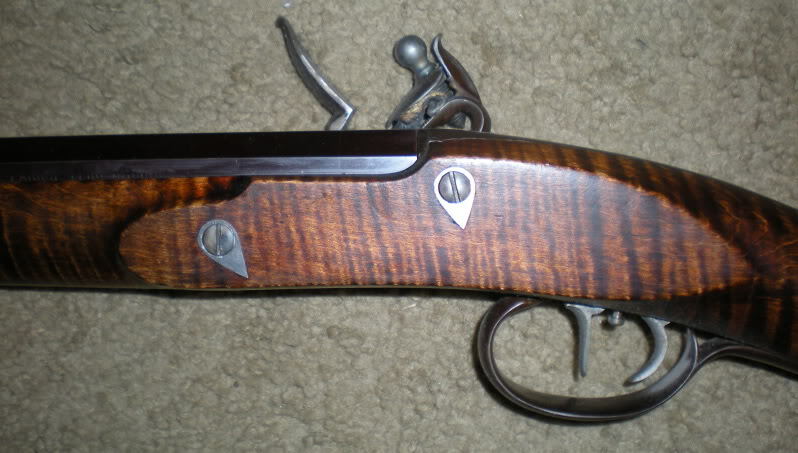 Circa 1812 Jacob Hawkens style full stock rifle (before his brother Samuel came out to join him), built in 1979. Here is mine 14th century Tannenbergbüchse. Here is a photo of one of my Scottish rifles that, unfortunately, is not the clearest but it does give you an idea of the overall architecture of the piece. This rifle represents one made in Scotland in the mid-17th c. then brought to America where it was at some point restocked in the French style. The lock area appears above. 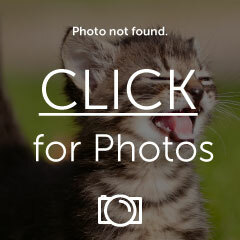 I need to make some better photos for myself and when I do I will post them here.